Street Magic Festival 2014… On Stage! 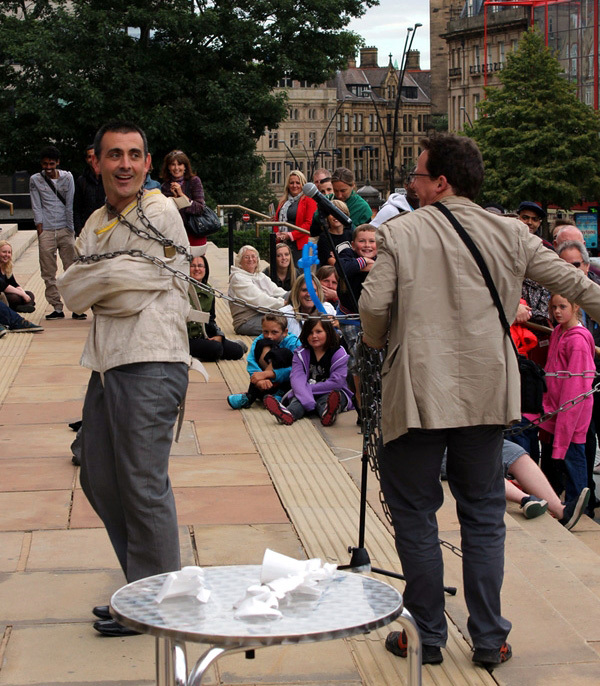 Steve Faulkner gets wrapped up in his work at the 2013 Sheffield Street Magic Festival. After last year’s successful debut, Sheffield’s Street Magic Festival is now bigger and better as part of Out Of This World – Sheffield’s festival of Sci-fi, Magic and Horror! Running over two days instead of one, the Festival is also adding a full magical stage show and a special ‘haunted magic’ show to the street performances. The stage show will be at The Sheffield Library Theatre, on Surrey Street, next to the Lyceum, on Sunday 2nd of November 2014. Also on the bill are many of Steve’s magical friends from Sheffield, and negotiations are currently under way to sign up some exciting guest stars. Tickets will be available shortly at £10 for adults and £5 for children under 16. Doors open at 7:00 p.m. and the show starts at 7:30 p.m.
For more details and updates as available keep checking this blog or ring 0114 2760482 between 11:00 a.m. and 5:30 p.m.